James Michael Furyk (born May 12, 1970) is an American professional golfer who plays on the PGA Tour. In 2010, he was the FedEx Cup champion and PGA Tour Player of the Year. He has won one major championship, the 2003 U.S. Open. Furyk holds the record for the lowest score in PGA Tour history with a 58 which he shot during the final round of the 2016 Travelers Championship. In September 2006 he reached a career high of second in the Official World Golf Ranking. He ranked in the top-10 for over 440 weeks between 1999 and 2016. Furyk was born in West Chester, Pennsylvania. His ancestry is Czech and Polish on his mother's side and Ukrainian and Hungarian on his father's side. His father, Mike, was an assistant pro at the Edgmont Country Club and later also spent time as a pro at West Chester Golf and Country Club as well as Hidden Springs Golf Course in Horsham. His early years were spent in the Pittsburgh suburbs learning the game from his father, who was also head pro at Uniontown Country Club in Uniontown, Fayette County. He graduated from Manheim Township High School in Lancaster County in 1988, where he played basketball in addition to being a state champion golfer. He played his junior golf at Meadia Heights Golf Club just south of Lancaster city. He played college golf at the University of Arizona in Tucson, where he was an All-American twice, and led the Wildcats to their first (and only) NCAA title in 1992. Furyk turned professional in 1992. He won the Nike Mississippi Gulf Coast Classic on the Nike Tour in 1993. He joined the PGA Tour in 1994 and won at least one tournament each year between 1998 and 2003. At the time, this was the second-best streak of winning seasons behind Tiger Woods and he made the top ten in the Official World Golf Ranking. Furyk's biggest win to date came on June 15, 2003, when he tied the record for the lowest 72-hole score in U.S. Open history to win his first major championship. In 2004, he only played in fourteen events after missing three months due to surgery to repair cartilage damage in his wrist; he missed six cuts and his highest finish was T6, which caused him to fall out of the top hundred on the money list. He returned to good form in 2005 and regained his top ten ranking, winning a PGA Tour event in that year and two in 2006. In the 2006 season, he finished a career-high second on the money list and won the Vardon Trophy for the first time. He had 13 top-10 finishes, including nine top-3s, four second-place finishes, and two victories. The 2010 season was a banner one for Furyk. After going more than two seasons winless, he won a career-best three tournaments on Tour in 2010: The Transitions Championship, the Verizon Heritage, and the season-ending Tour Championship. His victory in the Tour Championship also earned him the 2010 FedEx Cup after winning by one stroke. His accomplishments in 2010 won him both the PGA Player of the Year and PGA Tour Player of the Year for the first time. Since 2012, Furyk has come close on several occasions to winning more titles. At the 2012 U.S. Open, Furyk led after 54 holes and was still the leader deep into the final day, before snap hooking his drive into the trees at the 16th which led to a bogey and was followed by another at the 18th. He finished in a tie for fourth, two strokes behind Webb Simpson. At the 2012 WGC-Bridgestone Invitational, Furyk led after the first three rounds and looked set to win the championship as he held a one-stroke lead going into the final hole, but a double-bogey cost him the title to Keegan Bradley. At the 2013 PGA Championship, Furyk led by one stroke going into the final day over Jason Dufner, but this time his lead was overturned on the front nine and he was unable to reduce the deficit as Dufner won by two strokes. Furyk's caddy since 1999 has been Mike "Fluff" Cowan, who was Tiger Woods' caddy for Woods's first two years as a professional. On September 13, 2013, Furyk shot a 12-under-par 59 in the second round of the BMW Championship at Conway Farms Golf Club in Lake Forest, Illinois, becoming just the sixth player to shoot 59 in a PGA Tour event. In July 2014, Furyk held the 54-hole lead at the RBC Canadian Open, with a three stroke advantage over his nearest competitor Tim Clark. However Clark produced five birdies in his last eight holes to claim the title, after Furyk missed a 12 footer on the 18th green to force a playoff. The three shot margin was the largest 54-hole lead Furyk has ever lost in his tour career. In February 2015, Furyk held a one shot lead at the AT&T Pebble Beach National Pro-Am going into the final round, but shot a two over round of 74 to finish six strokes behind Brandt Snedeker. Furyk's round was the worst of any player to finish within the top 50 on the final day. Since Furyk's last victory at The Tour Championship in 2010, he is 0-for-9 with a lead/co-lead after 54 holes. On April 19, 2015, Furyk ended the long slump when he defeated Kevin Kisner with birdie on the second playoff hole at the RBC Heritage. The victory was his second at the event and his 17th victory on the PGA Tour. In 2015, at the BMW Championship, Furyk withdrew with a wrist injury. This was his first withdrawal since 1995, it also came at the same course he had shot a 59 two years before. Furyk qualified for the 2015 Presidents Cup team but could not play due to the same injury and instead became an assistant captain. J. B. Holmes replaced him on the team. Furyk missed the early part of the 2016 season after under-going wrist surgery. This caused him to miss the 2016 Masters Tournament and brought to end a run of 47 consecutive major championship appearances. In June 2016, at the 2016 U.S. Open, Furyk finished in a tie for second, three shots behind Dustin Johnson at one under par. He shot a four-under round of 66 in the final round to vault up the leaderboard. This was the third time during his career Furyk had been runner-up at the U.S. Open. On August 7, 2016, Furyk shot a 12-under-par 58 in the final round of the Travelers Championship at TPC at River Highlands in Cromwell, Connecticut, becoming the first player to shoot 58 in a PGA Tour event. This also made Furyk the first PGA Tour pro to card two rounds under 60. On January 11, 2017, Furyk was named as the United States Ryder Cup captain for 2018. At the 2018 Ryder Cup, the U.S. lost to the Europe team, 17 1/2 to 10 1/2 at Le Golf National outside of Paris, France. Following the matches, Furyk was subject to criticism from Masters champion Patrick Reed. Reed criticized Furyk's manner of making pairings and, more specifically, his decision to break up the previously successful Reed-Jordan Spieth pairing. The 2017–18 season was the first time Furyk was not fully exempt on the PGA Tour, playing the season with only past champion status. He started the 2018–19 season out of the 126–150 category. On March 17, 2019, Furyk finished second in The Players Championship, one stroke behind Rory McIlroy. The event has the best field of any golf tournament on the PGA Tour and it was a welcome result for 48-year-old Furyk, who barely qualified for the tournament and who had struggled with injury and poor play in 2017 and 2018. As Mike Furyk describes in a Golf Digest issue in 2001, Jim Furyk's hips "underturn" during the backswing and "overturn" coming down. On the downswing, he draws the club in a large arc behind his body (viewing from his right hand side), then pastes his elbow against his right hip at impact. David Feherty described Furyk's swing as "an octopus falling out of a tree". Gary McCord said that it evokes the image of "a one-armed golfer using an axe to kill a snake in a telephone booth." He is married to his wife Tabitha, and they have two children. He owns homes in the Kapalua Resort, and in Ponte Vedra Beach. ^ "The Daily Wrap-up, Round 4: The Tour Championship". PGA Tour. September 26, 2010. Retrieved September 27, 2010. ^ "Jim Furyk Wins the Canadian Open and is the New World Number Two". Official World Golf Ranking. September 11, 2006. Archived from the original on December 20, 2013. Retrieved December 20, 2013. ^ "69 Players Who Have Reached The Top-10 In World Ranking" (PDF). Official World Golf Ranking. Retrieved December 20, 2013. ^ "Players who have reached the Top Ten in the Official World Golf Ranking since 1986". European Tour Official Guide 09 (38th ed.). PGA European Tour. 2009. p. 558. ^ Morfit, Cameron (December 8, 2011). "Jim Furyk on hitting his prime at 40 and his future in the broadcast booth". golf.com. ^ Hawkins, John (June 1, 2008). "We Know What You Did Last Summer". Golf Digest. ^ "About Jim". Retrieved May 19, 2016. 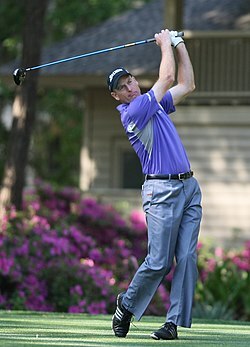 ^ "Former Wildcat Jim Furyk Wins U.S. Open Championship". June 16, 2003. Retrieved October 21, 2014. ^ "History - The Official Site of the 114th U.S. Open Championship conducted by the USGA". Archived from the original on June 29, 2013. Retrieved May 13, 2014. ^ "Jim Furyk – Profile". PGA Tour. Retrieved October 21, 2014. ^ "Jim Furyk – PGA Tour Career Summary". PGA Tour. Retrieved October 21, 2014. ^ "Jim Furyk edges Luke Donald to win Tour Championship". BBC Sport. September 27, 2010. Archived from the original on September 29, 2010. Retrieved September 28, 2010. ^ "Career Feats: Furyk named PGA Player of the Year; Kuchar earns first Vardon Trophy". PGA of America. November 15, 2010. Retrieved December 20, 2013. ^ "Furyk named PGA Tour's Player of the Year". PGA Tour. December 4, 2010. Retrieved December 20, 2013. ^ "Keegan Bradley wins after 64". ESPN. Associated Press. August 6, 2012. Retrieved December 20, 2013. ^ Brinson, Will (June 11, 2014). "Mike 'Fluff' Cowan doing double caddy duty at 2014 U.S. Open". CBS Sports. ^ "Jim Furyk hits golf's magic mark". ESPN. September 13, 2013. Retrieved September 13, 2013. ^ "Jim Furyk once again fails to convert 54 hole lead". Golf Channel. February 15, 2015. Retrieved February 22, 2015. ^ Harig, Bob (September 17, 2015). "Jim Furyk drops out after six holes". ESPN. ^ "Holmes to replace Furyk at Presidents Cup". Presidents Cup. October 2, 2015. ^ Schwartz, Nick (7 August 2016). "Jim Furyk shoots lowest score in PGA Tour history". Fox Sports. ^ Sobel, Jason (August 7, 2016). "Jim Furyk notches record for best PGA Tour round". ESPN. ^ "Jim Furyk named as United States Ryder Cup captain for 2018". BBC. January 11, 2017. ^ Porath, Brendan (October 1, 2018). "Patrick Reed's Ryder Cup wrath hit multiple targets. Here's a breakdown of how and why". SB Nation. Retrieved October 27, 2018. ^ "Rory McIlroy holds off Jim Furyk to win Players Championship at Sawgrass". BBC Sport. March 18, 2019. Retrieved March 18, 2019. ^ "Patience is pivotal for inconsistent Furyk". The Scotsman. July 18, 2007. ^ Richardson, John (June 5, 2014). 50 Greatest Golf Tips: Making the Dream Round a Reality. Belfast: Blackstaff Press. ISBN 9781634504713. ^ "Ryder Cup profile: Jim Furyk". The Guardian. September 13, 2004. Retrieved June 30, 2016. Wikimedia Commons has media related to Jim Furyk.